Used in combination with a Hammer. Metal Chisels can only be made from tool metals. They can be cast in ceramic molds, or worked on a metal anvil. Bismuth Bronze, Black Bronze, Bronze, and Copper Chisels can be cast using a Vessel or a Ceramic Mold instead of working on an anvil. Place an empty or partially filled Chisel mold into the slot to fill it with metal from the vessel. It takes 100 units of metal to completely fill an empty Ceramic Mold. The text in the vessel's GUI will be updated to show the amount of metal remaining in the vessel. Put the ceramic Chisel mold in the second input slot and wait for the filled mold to finished. Chisel Heads can also be crafted by using ingots on an anvil with a hammer. This is the only option for higher tier metals that cannot be cast. The durability depends both on the metal used and the skill of the smith forging the tool. Chisels are used to shape Raw Stone, Cobblestone, Smooth Stone and Plank Blocks into a variety of shapes and forms, as well as turn rocks into bricks. These bricks can be used along with mortar to craft brick blocks and brick walls. In order to use a chisel on blocks in the world, the player must also have a Hammer equipped in their hotbar. The mode of the chisel can be changed by pressing the Cycle Tool Mode key (Default:M), while having the chisel equipped. Turns Raw Stone into Smooth Stone; does nothing to other blocks. Turns the targeted block into a stair block. Creating upside-down stairs is done by targeting the bottom face of a block. Stairs created in this way do not drop when mined, and must be created on the spot. Cannot make corner stairs. Slabs the targeted face of a block. Each face may be slabbed a maximum of seven times, with each use of the chisel removing another eighth of the original block. Any face of the block may be slabbed at any time, meaning it is possible to create blocks of almost any size and position. Slabs created in this way do not drop when mined, and must be created on the spot. Slabs do not connect to fences or glass panes, and grass will grow under slabs of any size. Turns the targeted block into an 8×8×8 block consisting of 512 sub-blocks that can be chiseled away individually to have highly detailed work. Pressing the Lock Tool Location key (Default:L) locks the chisel to the last block which was detailed, making it easier to detail one block at a time. Pressing it again will unlock the chisel and allow it to detail other blocks. Detail mode is also required to use Blueprints. Blueprints allow the player to make one detailed block structure and copy it onto a blueprint, in order to easily create it again. Right-clicking with a blank blueprint on a detailed block will copy that detailed block onto each blueprint in the stack of blueprints. This will copy the block layout to every single blueprint item in the stack. When this is done, a GUI will open to name the blueprint for organization purposes. To use the blueprint, both a chisel and a hammer must be equipped in the hotbar. Right click on the block with a chisel in detailed mode to convert it into the subdivided block, then click on the block with the blueprint. Both the chisel and the hammer will take durability damage. To make a blueprint, simply combine one Paper and one Marking together in the crafting table. Cast something in metal to enter the Copper Age No stone unturned Fill a tool mold in a ceramic vessel filled with liquid metal. Added Chisel, used on raw stone in the world to create a Smooth Stone Block or with Cobblestone in a crafting table to create stone bricks. 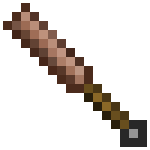 The chisel is used to make Smooth Stone blocks, stairs, and slabs. Right-clicking on the side of a stone block will shave off a layer from that side of the block, allowing customizable block shapes. Removed smooth/slab/stair the ceiling with a chisel when mining to evade cave-ins. Added support for chiseling wood. Added new Detailed chiseling mode that converts a block into 512 sub-blocks that can be individually removed for in-depth detailing work. Added locking of chisel to the last detailed block. Changed crafting recipe for stone bricks to use rocks instead of cobblestone. Adjusted chiseling rules so that you can not chisel any raw stone block that has raw stone, or an ore block, within the 2 blocks directly above it. All blocks that have been reshaped with a chisel are considered to be made of stone material, and therefore must be broken with a pickaxe. I.E. Plank blocks that have been chiseled into stairs must be broken with a pickaxe, not an axe. Any raw stone block that has raw stone, or an ore block, within the 2 blocks directly above it cannot be chiseled. Blueprints are directional-specific, so four separate blueprints are required for a full set of corner stairs (NE, NW, SE, SW). Shelves made from slabbed planks. Smooth Basalt detailed into a table. This page was last modified on 5 November 2014, at 05:44.